You’re miserable. You’ve tried to cover it up, but really, this job isn’t for you. Maybe the problem is a toxic environment, you’ve burned some bridges and relationships are strained. Or feel stuck in a rut and seek new challenges. Whatever it is, you know that it’s time to leave your job and move on. Tell your boss in person. While a formal letter of resignation is usually required (see the next step), it’s important to let your boss know in person if possible. Keep the conversation positive. This is not the time to list your grievances, but rather an opportunity to leave in a professional manner. After all, you never know where people are going to end up and you don’t want to burn bridges and create an awkward future situation. Write a resignation letter and be sure to thank your employer and immediate colleagues for their support. Never write a nasty letter that could go viral. Time to focus on your future. Smooth the transition. Offer to sit in on interviews and train your replacement. Again, this is a great reputation-builder. Clear your workload as much as possible before leaving. It would be easy – and probably feel pretty great – to let others face a huge pile of work as you head out the door. But it’s not fair to those who are left and definitely not the way you want to be known to operate. If you must leave immediately due to the sensitivity of the environment, thank your employer, clean out your desk, leave outstanding work neatly organized for the next person, and exit in a positive manner. Be pleasant to the people around you. If there has been tension in the office, realise that you are no longer part of it. Smile, you’re leaving, this is a good thing! As you go, shake a few hands, say thank you and goodbye. Be happy – it’s over! The days of staying with one organization for an entire career are long gone. Moving from one company to another at some point in your career is almost a given. 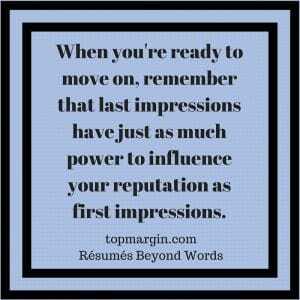 When you find yourself ready to move on, remember that last impressions have just as much power to influence your reputation as first impressions. A positive exit will ease the transition and allow you to start your next job with reputation intact and in the right frame of mind. If you’ve decided it’s time to move on and aren’t sure where to start, the first step is to get your resume in order. Click HERE to see how we can help your resume support the outcome you desire.